A collection of dazzling double halo diamond engagement rings. Journey through our finely curated collection of Soleste inspired double halo engagement ring styles. Within our collection, we have double halo rings, set with round brilliant-cut diamonds, Emerald-cut diamonds, Oval brilliant-cut diamonds to name just a few alternative diamond shapes for the double halo diamond engagement ring style. A double halo of round brilliant cut diamonds surrounds your chosen centre diamond and extends down in fishtail style shoulders. The setting sits proudly above the flat court profile and benefits from a wedding ring friendly setting. Precision set double halo and micro-pavé diamond shoulders. Large choice of certified centre diamonds. Includes an additional 0.50 carats (depending on centre diamond size) faceted F-G colour VS clarity round brilliant-cut diamonds in a double halo and across each Fishtail design, diamond set shoulders. Beautifully presented. Certification included. Worldwide delivery available. Discover the sparkle and beauty of the Emerald-cut diamond, double halo engagement ring. Inspired by designs such as the Tiffany Soleste, this unique engagement ring maximises brilliance from a central certified diamond, encircled within a double halo with diamonds set across each diamond shoulder. Emerald-cut central diamond. Double halo design. Fully certified diamond. Additional 0.40 - 0.50 carats of sparkling round-brilliant cut diamonds across the double halo and diamond set shoulders. Court profile 2.2mm wide band. Forked fishtail split shoulders. Tiffany Soleste inspired design. Precision setting. Full diamond certification with a minimum Very-Good cut grade. Beautifully boxed and gift packaged. 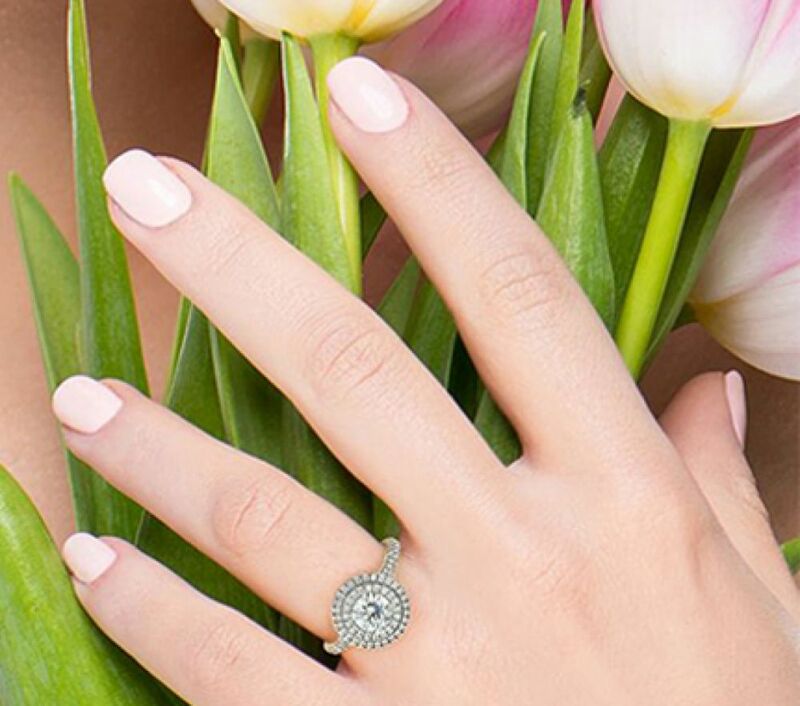 Discover the impressive dazzle from the Oval double halo engagement ring. Featuring an Oval brilliant-cut diamond of your choice, we include an additional 0.40 - 0.50 carats of perfectly faceted round diamonds across a double halo and within the diamond set shoulders. Wedding ring friendly setting. Precision set and finished. Large choice of certified diamonds. Additional 0.40 - 0.50 carats of perfectly faceted F-G colour VS clarity round brilliant-cut diamonds in a double halo and along each Fishtail designed shoulder. Beautifully presented. Certification included. Worldwide delivery available. This exceptional 1.25cts pear-shaped double halo engagement ring features a central 0.70cts pear-shaped diamond surrounded by a double diamond halo above diamond set shoulders. Crafted with a central Pear-shaped diamond, dazzling diamond shoulders rise up and divide below a double halo surrounding your chosen diamond in this exceptional double halo ring design. This distinctive double halo diamond engagement ring celebrates the captivating beauty of the round brilliant cut diamond. A precision cut central diamond dazzles within a double row of pavé set halo diamonds, – adorned with luxurious diamond shoulders. Choice of certified diamond options. Diamond set shoulders and double halo styling. Wedding ring friendly setting. Halo setting and shoulders pavé set with 24 x 1.2mm round brilliant-cut diamonds and 22 x 1.5mm round brilliant-cut diamonds. Total small diamond weight 0.55 carats in addition to your chosen central diamond weight. The double halo engagement ring was inspired by the original and classic Tiffany Soleste engagement ring. This dazzling ring style offers an enormous show—going way beyond the brilliance offered by the traditional single halo engagement ring styles. Each double halo setting is 100% wedding ring friendly. In addition, we offer each of the double halo styles in a full range of precious metals including 950 Platinum, 950 Palladium, 18ct White Gold, 18ct Yellow Gold and 18ct Rose Gold, set with your choice of certified diamond. Your chosen diamond is surrounded by an additional half-carat of dazzling small diamonds, pavé set with incredible detail.